This Rumble ended on 2003-06-01 00:00:00.0. Famous Father: Otik Sandath, an acclaimed innkeeper and cook well known for his Spicy Potatoes. Experience: Otik took in Tika when she was just a child and she was raised her entire life serving at the Inn of the Last Home. She left the Inn for a number of years before returning and becoming the premier cook for the legendary Inn. Favorite Recipe: "Otik's Spicy Potatoes." Motto: "He's not the man he used to be, you know. He's old, fat, slow-and he never was very bright. I doubt he could even kill a hobgoblin these days." Famous Father: Chen Kenmin, an acclaimed Chinese chef well known for his sauces. Experience: Chen has been with the show since its creation and is the only remaining original Iron Chef. He's naturally good humored and is best known for the goofy faces he makes. Favorite Recipe: "Shrimp in Chili Sauce." The Iron Chef: Chen has been selected to be Iron Chef for this challenge. The Challenger/Battle Match Up: Challenger in the first preliminary is Tika Majere Vs. Iron Chef Chen. She has worked as a serving wench, hostess, bartender, cook, warrior and innkeeper for the Inn of the Last Home located in Solace, Abansinia. According to the producers, Ms. Majere was chosen for this challenge from a list of 2,000 Ansalonian cuisine chefs. She beat out such fan favorites as Rulia Childeater from Blode and Silent Bitterleaf from Silvanesti. The Surprise: When tensions run high during the battle over a case of bad tuna on the Iron Chef's side, his accusations rile up the fiery temper of the red headed chef. 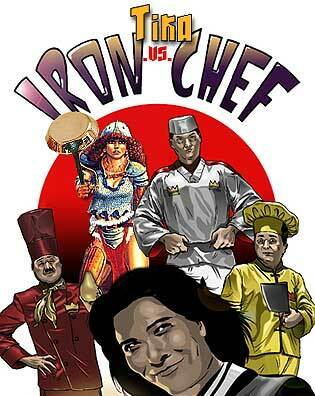 Tika storms across the kitchen arenas and attacks the Iron Chef with a frying pan. He takes a glancing blow and counters with a toss of Cayenne pepper into Tika's eyes blinding her before the assistant chefs can tear them apart. Now the battered chefs must race to beat the clock and impress the panel of judges with their culinary expertise before they turn on each other again.